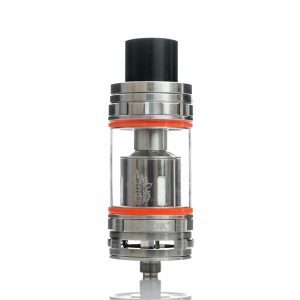 What Are The Best Sub-Ohm Tanks? Over the past few years, sub-ohming has rapidly grown in popularity as the sport of cloud chasing has exploded. These massive clouds of vapor can fill a room or your car with an impenetrable wall of fog in seconds. So if you want to make massive clouds, you need to have the best sub ohm tank in your vape mod and know how to make it perform to its maximum effectiveness. Sub-ohm vaping is just as much about creating massive clouds of vapor as it is about the quality in your vape tank. Having the wrong vape tank can leave you with a wet spot on the front of your pants, residue on your lipstick tube, or in the bottom of your purse. Imagine standing in front of a large body of students to give a lecture, only to have an inconvenient “wet spot” on the front of your pants (been there done that). The best vape tanks are designed to work with the best sub-ohm coils as well as keep your e-liquid contained. This being said, if you like the idea of producing massive clouds of your favorite vape juice for everyone around you to enjoy, then read on to see what the best sub-ohm tanks have to offer. Let’s begin by taking a look at the best vape tanks on the market for the beginner to serious cloud chaser. The Kayfun V5 RTA may be one of the best mouth-to-lung (MTL) and direct-to-lung (DTL) vape tanks on the market. The tank atomizer is fully rebuildable. Its release was highly anticipated by lovers of both forms of vaping and safe to say the promise of continuing SvoëMesto’s reputation for powerful yet highly versatile RTAs. One feature that makes the V5 very popular is the variable position airflow adjuster. You choose from four different positions ranging from full MTL all the way to DTL. Others really love the hooks that help hold the coil in place while you tighten the screws. But, the one feature everyone seems to truly love, is the flavor the V5 produces while still creating massive clouds of vape. For those chasing flavor AND big clouds, this is the best sub ohm tank. The Pharaoh Mini is unique in that it makes use of a “dual bridge clamp post deck with quad post holes.” This allows you to use it for massive builds that let you turn out colossal clouds at the press of the fire button on your mod. Comes set up for 2ml tanks and includes 2 x 2ml tanks, 1x5ml adaptor and 2x5ml tanks. 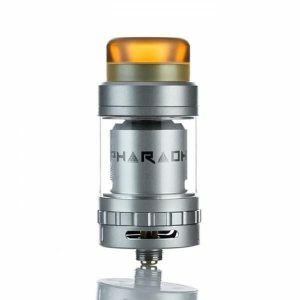 The Pharaoh Mini is a bottom airflow style of RTA, which tend to be the best sub-ohm tanks, with an air flow control that clicks firmly into each setting. No guessing, no wondering, even while its screwed into your mod. To make filling easy, there are three holes in the top that will accommodate virtually any size tip for easy non-messy filling. 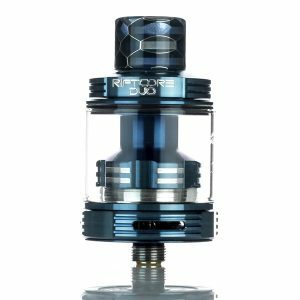 The Triple 28 RTA is the latest offering from Vandy Vape and offers vapers triple their pleasure in a single tank. You get triple the flavor and triple the vape clouds. With the Triple 28 RTA, you can create double and triple coil builds that will have you creating massive crowds in minutes. Designed on the back of the TFV4, the TFV8 took an already excellent tank and elevated it to a new level. Using Smok’s new line of “turbo coils,” that have been designed to handle higher wattages at lower resistance (it comes with one each of these coils: Octuple 0.15Ω, Quadruple 0.15Ω, and Exclusive Turbo RBA 0.28Ω. Along with this, the TFV8 comes with an extra-large 6ml tank that allows for much higher airflow rates through the bottom for maximum vape customization. 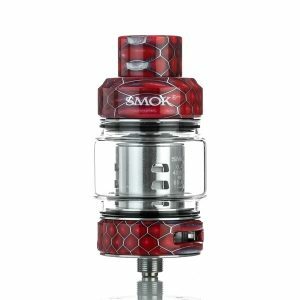 The TFV8 features Smok’s signature hinged top-fill system that makes use of a hinge and lock instead of threaded fitting to make filling the tank simple. The other advantage to this hinge/lock system is that you never need to worry about cross-threading your top and ruining your tank. With the precision airflow control, huge 6ml tank, and “Turbo Engine” coils, the FTV8 can produce massive clouds that are sure to drive everyone out of the room. The Sense Herakles 3 sub-ohm tank marks the return of one of the most popular tanks on the market. It features a flip-top lid that can hold up to 4.5ml of juice. Manufactured from a blend of glass and stainless steel, the triple adjustable airflow allows you to fully customize your vaping experience. The Crown 3 III sub-ohm tank offers is a top-fill tank with a capacity of 5ml. The plug-pull mechanism is used to swap coils quickly and seamlessly. This sub-ohm tank features dual airflow slots around the basis of the tank chassis for better cooling and has an improved chimney design to improve flavor. The SLYDR L sub-ohm tank is one of the largest tanks on the market, holding a massive 5.5ml of your favorite e-juice. It also uses larger coils to help the user produce even more clouds for the cloud chasers and offers an excellent flavor profile for those who are interested in finding the best flavor. The new Riftcore Duo from Joyetech represents their desire to step outside of the box that they have been comfortable in. This is the first vape to come from Joyetech to be rebuildable, albeit the only thing you can do is “re-wick” it. Instead of coils, this RTA features a pair of heating blocks mounted on opposite sides of the deck with the wick in the middle. Joyetech estimates these heaters will keep going for up to a million puffs. The Riftcore Duo can be used with a single 0.5Ω block or with dual 0.25Ω blocks. Recommended operating range of 40 to 50 watts. Joyetech has even made cleaning the Riftcore Duo easy. All you do is remove the wick, heat the RFC plates at 30 watts, let them cool, and rinse repeat until everything is clean. If you are a cloud chaser seeking to create non-stop clouds of your favorite e-juice, the Resa might be just the ticket. The fabulously designed resin tank can hold up to 7.5ml of your favorite juice! Due to the manufacturing process, each Resa Price has its own unique coloring and pattern. 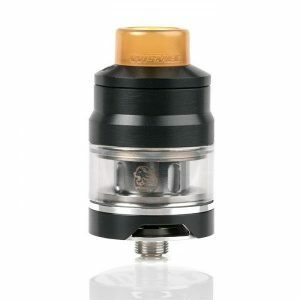 The Resa makes use of the TFV12 Prince coil system and a rotary hinge top-fill tank. The LED light-up coil combined with the new 0.12Ω Prince T10 red-light that has a range of 60 to 120 watts. In the kit, you also get the 0.4Ω V12 Prince-Q4 quadruple coil that is rated at 40 to 100 watts and the 0.15Ω V12 Prince X-6 Sextuplet coil rated at 50 to 120 watts. This is a 4ml version of the 2ml GNOME by Wismec and is a great little mini tank that produces substantial clouds and exceptional flavor. The design features a sliding top to make filling it a breeze. The bottom of the tank features a sliding airflow adjustment that lets you customize your vape to suit your personal tastes. Even the 4ml tank seems shorter than most, but that could be due to the 25mm diameter. The tank glass lets you quickly see how much e-juice you have left at a glance. Airflow is achieved through two large slots located at the base of the tank and is adjustable from restricted all the way to wide open for massive hits. The GNOME can be run in the 55 to 65 W range with the WM02 coil or in the 80 to 90W range with the WMO3 coil. Unlike most tanks you buy where you only get one configuration, the Aspire Quad-Flex comes with everything you need to build your perfect tank. You can use all the parts in the package to customize your tank 4 different ways. This tank is available in both stainless steel or black finishes. What makes the Quad-Flex unique, is that while most might think it is for the advanced vaper, in reality, the design is perfect for everyone from the beginner to the most advanced cloud chaser. Inside of the box, underneath the lid, it shows you how to assemble each of the four variations, so whatever you do, don’t throw the box out, or at least take a picture of it before you do. If custom fitting the airflow to your personal tastes is one of the most important features in a vape tank then the Sapor just might be what you’re looking for, the Sapor might be the perfect fit. Using a dual-adjustable top airflow is a completely different but highly effective way of bringing the most amazing flavors. The Pangu is a tank for all vapers, both MTL and DTL. This tank makes use of a very different type of coil, the PGOCC. This coil actually runs up the side of the tank in a tube and out of the top where it is tucked in a resin cover. The concept behind this radical design is that you can change the coil without wasting any of your e-juice. Juice flow is easy to adjust by turning the coil tube to expose more of the cotton. While you can run the Pangu at 40 watts, it works just fine at only 27 watts. The one thing missing from the Pangu, is adjustable airflow which leaves you with no option, it is in the fully open position which may not be the best choice for those who love to customize their vaping experience. 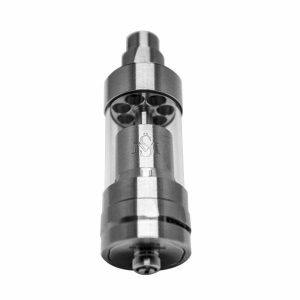 Overall this is an excellent low-cost beginner tank with a good MTL or DTL experience. Let’s start by saying this is the smaller brother to the TFV8 Cloud Beast Tank and as such the majority of its specs are scaled down versions of the Baby Beast’s big brother. To start, it comes with a 3ml tank instead of the full-size 6ml tank in the Cloud Beast and uses the Turbo Engine Coil Structure for superior performance. We have put together a little information guide on sub-ohming to help those who are interested in acquiring better flavor and bigger clouds. We hope this guide helps you realize your sub ohming dreams by gaining a better understanding of the whole concept. What is Sub Ohm or What Does Sub Ohm Mean? 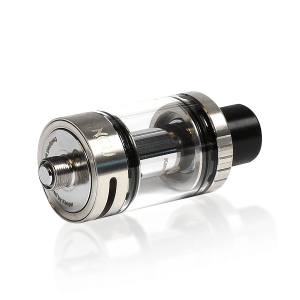 A sub-ohm tank is an atomizer that uses a coil with less than one ohm of resistance. The design delivers more flavor and much larger clouds of vapor. Sub-ohm tanks superior coil design and better airflow to make you get the most out of your preferred flavor of e-juice. Some are designed to work together with the latest in digital computer-controlled tank mods. Sub-ohm vaping is the use of a tank featuring a coil that measures less than 1.0Ω of resistance. By using larger batteries and adjustable voltages, you can alter the wattage at the coil increasing or decreasing the heat it produces. In turn, this affects how much vapor is produced with each puff. They also make use of variable airflow vents somewhere on the tank to assist in the production of those massive clouds of vapor you see floating around everywhere you go. Do You Need a Special E-Juice to Sub-Ohm? If you plan to use a sub-ohm tank, it’s recommended that you use a different type of e-juice. Sub-ohm vapes are best used with a special type of e-juice that is high in vegetable glycerin. When using this type of juice along with a low-resistance coil and powerful battery, you can produce massive vape clouds like those made by vapers who like to do tricks with their vape clouds. What is Direct-to-Lung (DTL) Vaping? Direct-to-lung vaping is very common among those who use sub-ohm tanks. When you smoke a cigarette, this is referred to as Mouth-to-Lung as you start by sucking the smoke into your mouth and then inhaling it into your lungs, two steps. With Direct-to-Lung vaping, you inhale the vapor straight from the vape to your lungs, a single step with no stopping in between. Depending on your personal vaping tastes, this can help you produce much larger clouds, or you may find it uncomfortable and prefer to stick to an MTL vape. This may be one of the greatest criticisms (beyond the massive clouds) that most people seem to have with sub-ohming. Some vapers truly enjoy the loud sound a sub-ohm tank makes (it’s a little like the sound of a kettle boiling). The noise is created because the coil in this type of tank operates at a much higher temperature causing the liquid e-juice to become super-heated. This results in the popping, crackling or bubbling noise you hear each time you press the fire button. Sadly (at least for some of us) there is nothing that can be done about this noise, as it is all part of the process needed to create those incredibly large clouds your friends have floating around their heads all the time. Most people believe sub-ohming is not for the beginner as the massive amounts of vapor can be hard for your lungs to handle at first. The good news, you can always work your way up to sub-ohming. How Do You Clean a Sub-Ohm Vape Coil? Remove the coil from the tank. Add rubbing alcohol to a small container with a lid. Add the dirty coil to the tank and close the lid. Let the coil soak in the rubbing alcohol overnight; this ensures that when you are done, the cotton is nice and clean and all traces of e-juice are removed for the cotton and the coil. You should do this each time you change flavors as well, this way the only thing you taste is the flavor of the new e-juice. Time to dry the coil by patting it dry with a soft towel and then using a hairdryer. This helps to remove all traces of the cleaning solution from the coils. The only thing left to do is prime the coils and put them back in the tank, and you are ready to go. How Do You Prime a Sub-Ohm Coil? The concept behind priming your sub-ohming coil is to ensure they last longer and offer better performance. This, in turn, gives you improved flavor and a smoother overall vaping experience. The first step is to add a few drops of your favorite e-juice to the coil and wick. This helps to jump-start the wicking process. Follow this up by assembling the tank and filling it with the rest of your e-juice. Let it sit for several minutes; this enables the coil to soak up more of the juice and helps to ensure you never have to deal with dry hits. Finally, take a few hits without hitting the fire button. Doing this draws even more e-juice liquid into the coil and further aids in the wicking process. Keep the number of puffs below five, or you could flood the coil. Are There Different Sub-Ohm Coil Materials? Since the wire used to create a sub-ohm coil is one of the more vital parts of all that goes to make up a good sub-ohming rig, choosing the right metal is important. The wire chosen affects the amount of vapor produced and its flavor. There are five different wire materials commonly used to create sub-ohm coils. These are Kanthal, nickel, nichrome, stainless steel, and titanium. Kanthal – A blend of chromium, aluminum, and iron, Kanthal is the most common wire for e-cigs. It is also the same wire used in the average toaster. The only real problem is that it takes a little extra time to heat up. Nickle – Is commonly used in temperature controlled vapes as it has only 0.6Ω of resistance per foot. It gives you the most accurate temperature adjustment, but some vapers think it affects the flavor of the vape. Nichrome – A blend of chromium and nickel, it offers lower resistance that Kanthal and because of its lower resistance may be a better choice when your mod doesn’t have the room for a Kanthal coil. Stainless Steel – Pure surgical steel is becoming a very popular metal for use in vaping coils as it has very low resistance. It heats up quickly and is good for both mode and temp control vapes. Titanium – Has a higher resistance level than stainless steel which means you will need more wraps to produce the same resistance as a stainless-steel coil. It is stronger than nickel, which will make wrapping it much easier for you. In the end, it is up to you which metal you choose. Many base their final choice on the impact the particular metal has on the flavor of their vape. In the end, deciding whether to embark on a sub-ohming journey or not is your decision. This is only the beginning of all there is to know about sub-ohming tanks and what to look for. Hopefully, this information has started you off in the right direction and will help you make the right choice. Keep in mind that you do need to match your sub-ohming tank with the best vape mods on the market and batteries for a great vape experience. Most of all, once you choose your sub-ohm tank, be sure you invest in top-quality e-juices that are high in vegetable glycerin as these are the only ones capable of producing massive tasty clouds of vapor every time you hit the fire button. Happy vaping!